Black men and boys are more likely to die in encounters with Toronto police than those from other racial groups, new data compiled by CBC News suggests. This story is part of Deadly Force, a CBC News investigation into police-involved fatalities in Canada. In Toronto, the 19 black people killed in encounters with Toronto police account for 36.5 per cent of the fatalities, despite the fact that black people make up just 8.3 per cent of the city's population during this time, according to the data. Simone Wellington, whose 15-year-old son Duane Christian was killed by a Toronto police officer in 2006, says the prominence of black victims in this city doesn't surprise her. "No one in the black community is surprised by that," she told CBC Toronto. "There are things that we have to deal with that other races, ethnicities and cultures don't." 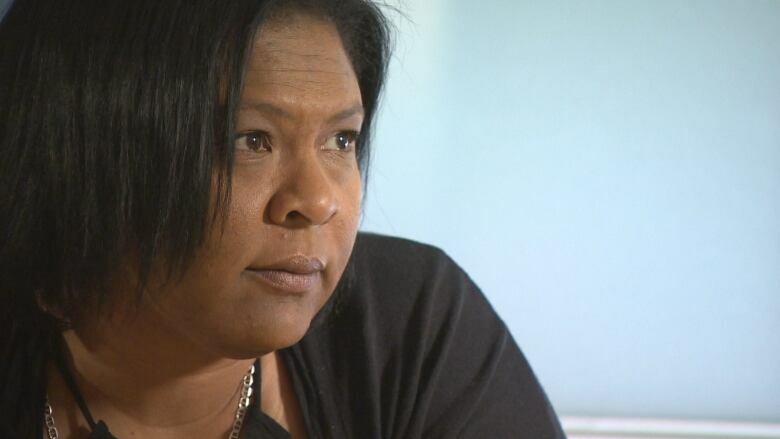 Wellington says she's convinced her son's race played a role in his death. 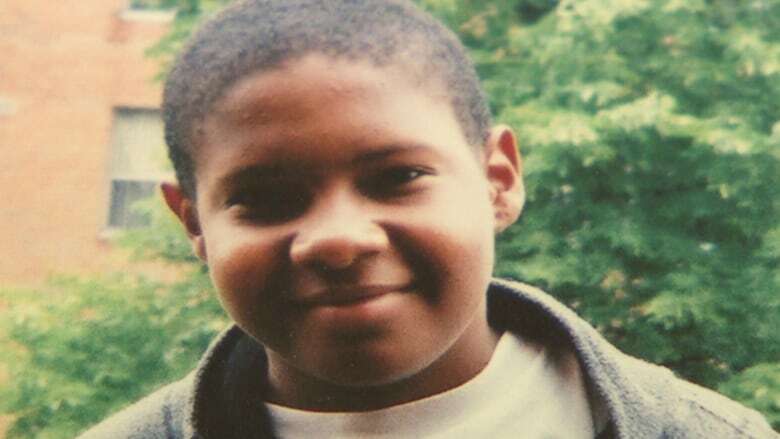 "I think that if he wasn't a little black kid, he wouldn't have been shot," Wellington said in an interview. 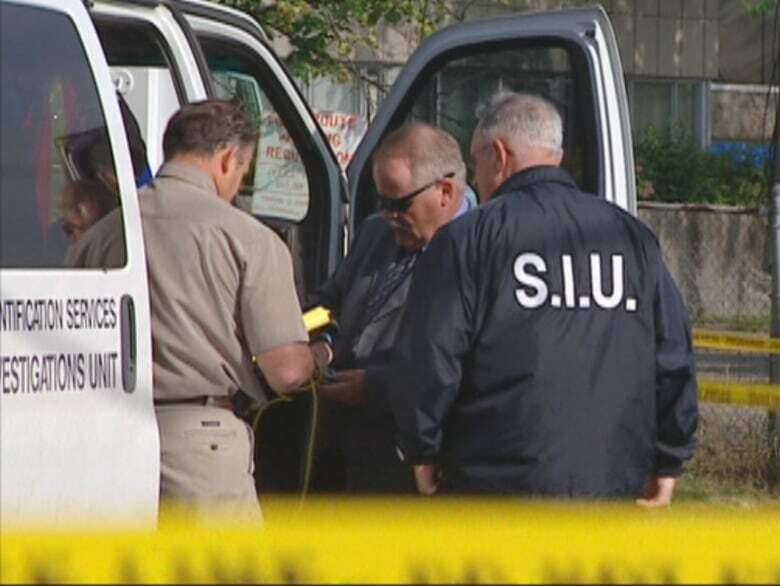 Ontario's Special Investigations Unit (SIU), which investigates all police-involved deaths in the province, concluded the officer's actions were legally justified because he feared his partner would be struck and killed by the van. The shooting happened just outside of the family's home. Wellington heard the gunshots and ran outside. "He died either while I was upstairs hearing it, or when he was 30 feet away from me," she said. 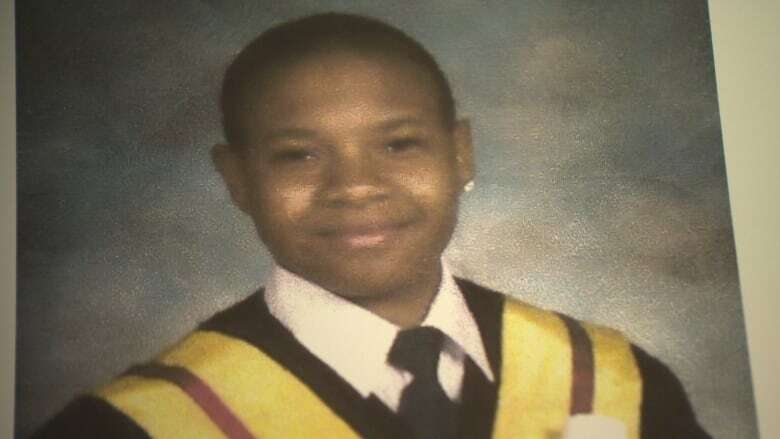 Wellington said her son was bright, compassionate, loyal and family-oriented. "It just didn't make any sense," she said. In an email statement sent to CBC Toronto on Thursday, Toronto Police spokesperson Kevin Masterman said "our training of officers teaches them to react to an individual's behaviour, not their appearance." "We also have training for officers to recognize and address implicit bias," the statement said. The Ontario Human Rights Commission is looking into the actions of the Toronto Police Services between 2010 and 2017 to determine if the force engaged in racial profiling or racial discrimination against the black community during that time. Christian died the way most of the victims in the CBC data did. Nearly two-thirds — 35 of 52 people — were shot by police officers. The remaining died either from restraint, physical force or other medical complications during their interactions with police. CBC News was unable to determine how three of the victims died. 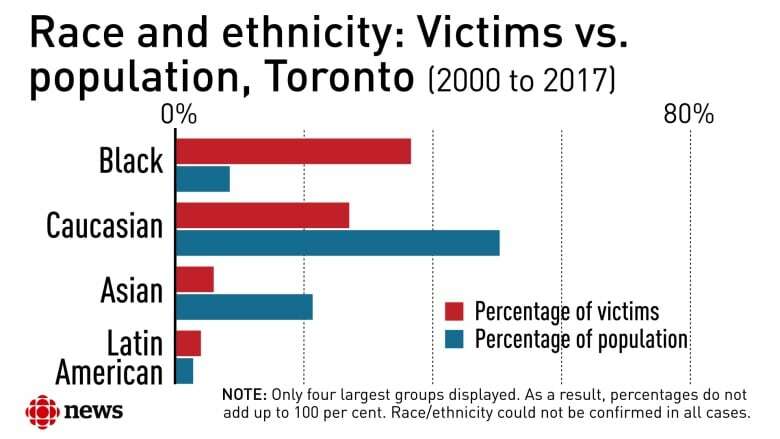 There were 14 Caucasian people killed in encounters with Toronto police between 2000 and 2017, while 11 victims are listed as having an "unknown" racial background. 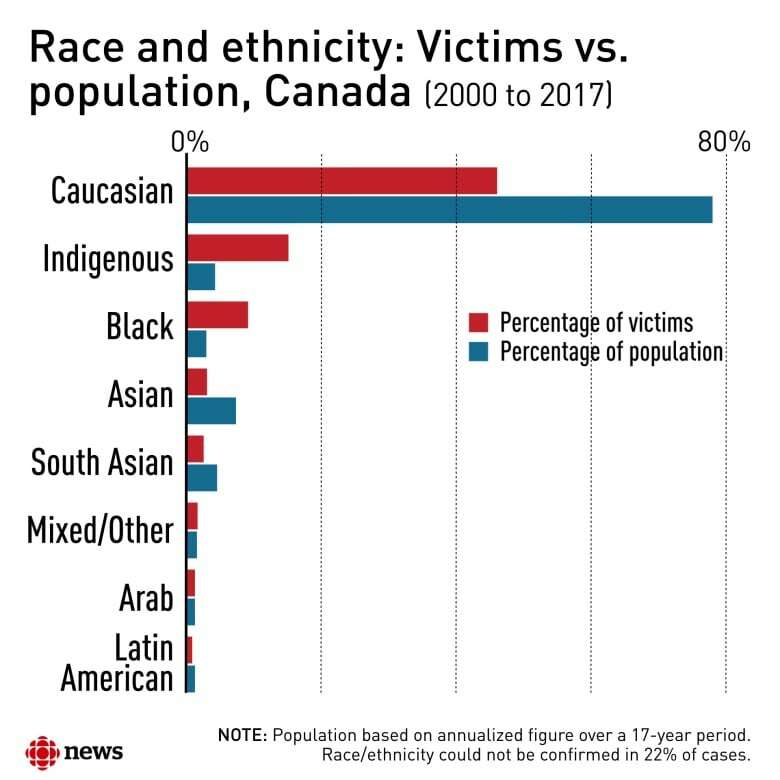 Nationally, Caucasian victims, at 45.7 per cent, far outnumber other racial groups. Across the country, 9.5 per cent (44) of victims were black. Most of the victims killed in encounters with Toronto police had some sort of a weapon. The most common, in 17 cases, was a blade of some kind. Seven of the victims possessed a firearm and six had a replica gun or air pistol. Reports show 14 of the victims were unarmed. Over 17 years and 52 incidents, just seven Toronto Police officers have faced charges after being involved in the death of a civilian. Only one was found guilty. In 2016, Const. James Forcillo was charged with second-degree murder in the 2013 fatal shooting of Sammy Yatim, and sentenced to six years in prison. He is appealing his conviction and sentence. Yatim was 18-years-old, armed with a knife and high on drugs when he was shot multiple times by Forcillo on a Toronto streetcar. A jury found Forcillo guilty of attempted murder, a confusing and controversial ruling made possible by the Crown separating the officer's shots into two distinct volleys of bullets. Meanwhile, Wellington says she's still unhappy with the investigation into her son's death. The family attempted to sue the SIU, but their case was ultimately rejected by the Supreme Court of Canada. "I don't really know what happened to this day. I'm never going to know because no one's ever going to tell me," Wellington said.